Back in 1981 Silas Warner created a game for MUSE Software which would go on to spawn an entire army of clones. Silas is probably better know as the author of the legendary Castle Wolfenstein. However it was RobotWar which went on to inspire a whole new genre. 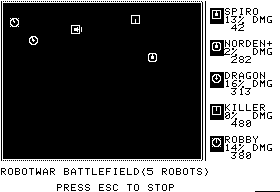 Silas developed RobotWar for the PLATO computer system and later ported it to the Apple II for release by MUSE. The game is set at a time in the distant future when war has been declared hazardous to human health. Wars still rage, but the combatants are robots programmed to battle to the death. Scanner is a simple stationary warrior. The first instruction (at scan) turns the gun 7° clockwise. The next instruction (at check) lines up the radar with the gun. The radar returns a positive number if it detects nothing, otherwise it returns minus the distance to the opponent. The next line jumps back to scan if the radar returns positive. Otherwise a shell is fired by the penultimate instruction and the next line jumps back to check. RobotWar earned a strong following in the early 1980's. Computer Gaming World organised annual tournaments and a group of enthusiasts formed the Postal RobotWar Club of America. Robocode is currently the most active. More information is available on the RoboWiki. Please let me know if you think I've missed an important robot programming game or one of historical note. Also I'd love to hear from you if you have any memories of the above. You forgot RoboWar! But I forgive you - it was Mac-only for many years. This was one of my favorite games growing up. Right now, strangely enough, the de-facto current version is only available on windows. Battlecode is pretty big at my school: http://battlecode.mit.edu/2009/ also done in java. I loved all these games. We even had big competitions in the area I lived and the winner got a hundred bucks. I remember how cool this was on the APPLE ][+, which is what the screenshot is from.